A herbal supplement, Tibetan Rhubarb is derived from the roots of the Qinghai-Tibetan Plateua's Rhubarb, grown wild at an altitude of over 3000 meters (10,000 feet) above sea level. Other high quality herbs have also been used in the production of this tea. Rhubarb, Huaimi, Scutellaria barbata, sugar. 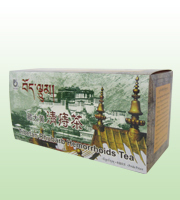 Clears away heat and toxins, helps Tongbian, antimicrobial, protects the liver, removes hemorroids to eliminate swelling, long-term use may prevent hemorrhoids, and maintains a healthy weight. This product contains Rheum (Rhubarb). Read and follow directions carefully. Do not use if you have or develop diarrhea, loose stools, or abdominal pain because Rhubarb may worsen these conditions. Consult your physician for children under 8 years old or if you have frequent diarrhea or if you are pregnant, nursing, taking medication, or have a medical condition.